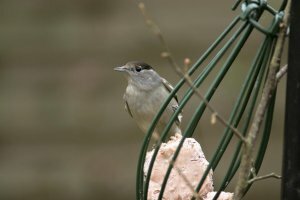 New research using data from Garden BirdWatch has revealed that bird food provided in British gardens has helped Blackcaps to rapidly evolve a successful new migration route. This is the first time that garden bird feeding has been shown to affect large-scale bird distributions. The research uses data from volunteer Garden BirdWatchers. Since the 1950s, Blackcaps breeding in southern Germany and Austria have increasingly migrated in a north-westerly direction, heading towards Britain for the winter rather than taking the traditional south-westerly route to wintering grounds in southern Spain. Research has revealed that this new migration strategy is genetically encoded and is maintained through reproductive isolation and fitness benefits on the breeding grounds. The result has been a rapid increase in the number of Blackcaps wintering in Britain over the past 60 years, such that the species is now a familiar visitor to garden feeding stations across the country. Have conditions in Britain helped to drive this evolutionary change? Early observations of wintering Blackcaps in British gardens coincided with the wider introduction of commercial wild bird foods, so it is conceivable garden bird feeding introduced a selection pressure for the evolution of the new migration strategy. However, it is unlikely that this will have been the only factor driving the change. Winter conditions in Britain have become milder and this may have led to improved overwinter survival rates for the Blackcaps choosing to winter here. But which is the more important? Unravelling the underlying mechanisms driving the evolution of this change in migration route requires long-term monitoring data, collected at a landscape scale. Fortunately, BTO's weekly Garden BirdWatch survey provides data of just the right form and scale to explore the spatial distribution and between year variation in Blackcap wintering behaviour, additionally allowing examination of both of these components in relation to the availability of supplementary food and local climate. If the provision of supplementary food has influenced Blackcap migration, we might predict that Blackcaps would be observed more frequently where there is a reliable source of garden bird food and that there may be evidence of an increased association with food over time. If climate has limited the Blackcap’s winter range, we might predict that Blackcaps would be observed more often at sites where the winter climate is warmer. How were the data analysed? Kate Plummer and colleagues extracted data for Blackcap presence and absence per site for 12 winters (1999/2000 to 2010/2011), capturing the period when these central European birds are most strongly associated with garden habitats. The final data set included 3,806 Garden BirdWatch sites and was based on those sites from which at least 16 weekly submissions in a minimum of nine winters had been received. Garden BirdWatch participants record the food provided at their sites each week, but not which species were feed on which foods. To capture this information, and use it to inform which foods to include in the analyses, a questionnaire survey was circulated across participants who had recently had Blackcaps using their gardens. This revealed that fats and sunflower hearts were the preferred foods for visiting Blackcaps. The analyses also included a measure of local habitat, derived from the CEH Land Cover Map and used to test for any potential ‘heat island effect’ – urban areas are warmer than rural areas because of the waste heat escaping from buildings and shops. Also included were mean monthly temperature data extracted from the Met Office UK Climate Projections dataset, latitude/longitude and year. Generalized linear mixed models were then used to examine the predictors of variation in Blackcap wintering behaviour. Blackcaps showed greater occupancy of sites in the south and west of Britain, where wintering conditions are milder. The authors found strong evidence that Blackcap occupancy rates are influenced by both supplementary food and climatic temperature; Blackcaps were recorded more often at sites that provisioned food more frequently and, most interestingly, Blackcap occurrence has become more strongly associated with supplementary feeding over time. The birds showed a preference for wintering sites that had a warmer local climate, with the use of GBW sites reduced in those years when the winter weather was milder. This work provides the first direct evidence of the underlying mechanisms that have influenced the contemporary evolution of migratory behaviour in Blackcap. Over a 12-year period, Blackcaps have become increasingly associated with the provision of supplementary foods in British gardens and the reliability of that provisioning is influencing their distribution at the national scale. The findings suggest that climate amelioration is also likely to have enabled Blackcaps to expand their wintering range into Britain. The increasing association with supplementary food over time suggests that Blackcaps are adapting their feeding habits to exploit human-provisioned foods, complementing recent evidence that those Blackcaps migrating to Britain in winter are diverging phenotypically, as well as genetically, from those that winter in Spain. Blackcaps wintering in Britain have relatively narrower and longer beaks than those wintering in Spain, suggesting that British migrants have adapted to a more generalist diet. The study provides new and timely evidence of the role that human activities can play in shaping the evolutionary trajectories of wild bird populations. Is supplementary feeding in gardens a driver of evolutionary change in a migratory bird species? Global Change Biology. BTO Garden BirdWatch is funded by its community of participants, who give so generously of their time and money. This research has been supported by kind donations to the BTO Young Scientists’ Fund through the Garden BirdWatch Appeal. Garden BirdWatch is a volunteer survey which monitors the changing fortunes of birds and other garden wildlife through its network of citizen scientists. The BTO is always looking for more garden birdwatchers to record their observations.